Regional candidates of the leftist Podemos party during a campaign rally ahead of local elections, Pamplona, Spain, May 16, 2015 (AP photo by Alvaro Barrientos). As Spain heads into general elections this fall, all eyes are on two new political parties that threaten to upend the political establishment. On the left is the much talked about Podemos, the fiery left-wing movement so often compared to Greece’s far-left Syriza party. 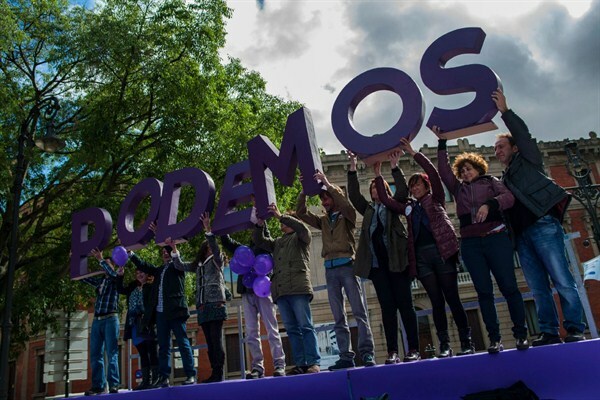 With an eye toward improving its electoral prospects, in recent months Podemos has moderated the radical economic program that first brought attention to the party.